The Russ Hill Hotel, Europa Gatwick and The Airport Inn are the three Britannia Hotels that are located close to Gatwick Airport. All three offer 24 hour flight transfers and airport parking for 4, 8 and 15 days. The Europa Gatwick Hotel, with over 240 rooms, restaurant and bar is the ideal place to spend a night before a flight, enjoying a drink overlooking the stunning courtyard area, or perhaps a tasty evening meal before turning in for the night. This hotel also offers airport parking – peace of mind for car owners who need somewhere to secure their vehicle while they are away on business or holiday. 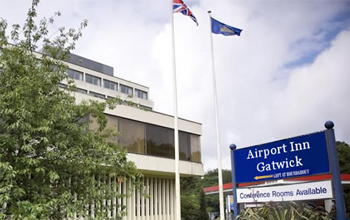 The Airport Inn Gatwick is the closest hotel to the airport and has facilities that appeal to aeroplane travellers, such as free Wi-Fi connection and 24 hour flight transfer service. This hotel is also ideal for the family – guests can book their room online, check in with us and sit back and relax in one of our bars or restaurants while they wait for their flight check-in. Finally, The Russ Hill is a wonderful hotel, located in nearly 10 acres of glorious English countryside in the quaint Charlwood village. More importantly, it is just 4 miles from Gatwick airport, so why not book a Stay and Fly package at the Russ Hill, one of the best Gatwick Airport Hotels?